Charles Dickens’ Bleak House spins a tale of mystery, intrigue, family dynamics, and irony in the Victorian age that had readers gripped by its indictment of the English court system. While the novel is packed with intricate plot twists and turns, the main story line centers on the contested will case of Jarndyce and Jarndyce, which when it finally ends, finds that the costs of litigation have entirely consumed the estate. The erosion comparison is unfortunately apt when compared to the current state of the hedge fund industry. 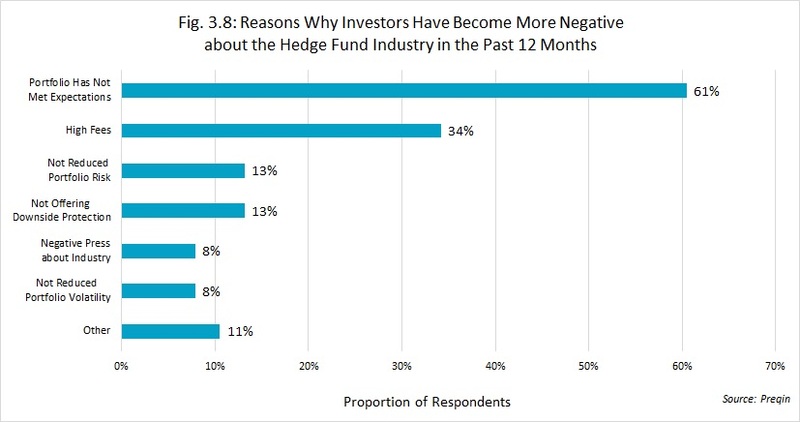 Four out of every five of the investors interviewed in June 2016 expressed disappointmentwith hedge funds for failing to meet their return expectations over the past 12 months. 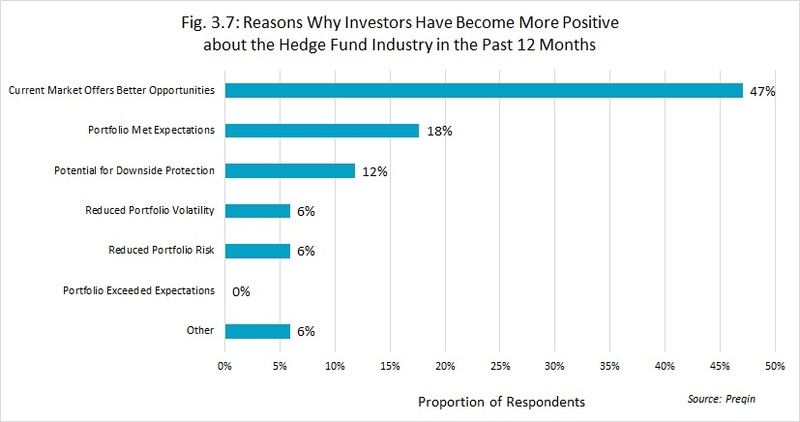 Significant numbers of investors, approximately 39% of those Preqin surveyed, plan to reducethe amount of capital they have invested in hedge funds over the next 12 months. Less than half this figure (18%) plan to increase their exposure. Hedge fund managers are feeling the impact of this gloomy outlook, and as 2016 winds down, remain concerned with what implications these views might mean for fund allocations next year. However, there were some glimmers of hope also captured in this survey data. As global market struggles continue to foster uncertainty among investors, a good chunk (47%), still believe that hedge funds can navigate this type of market climate successfully, and 18% are believers in the downside protection and volatility mitigation benefits these funds can offer. Managers who outperformed their benchmarks during this period would be wise to present their experiences to prospects seeking conviction that there are still strategies that can perform to expectations and deliver while equities and fixed income aren’t. One way to articulate this is through a case study narrative that walks the investor though what the hedge fund manager actually did in the difficult market period in which they outperformed. Why was the investment initiated, how was it managed, and when was it exited and with what end result? 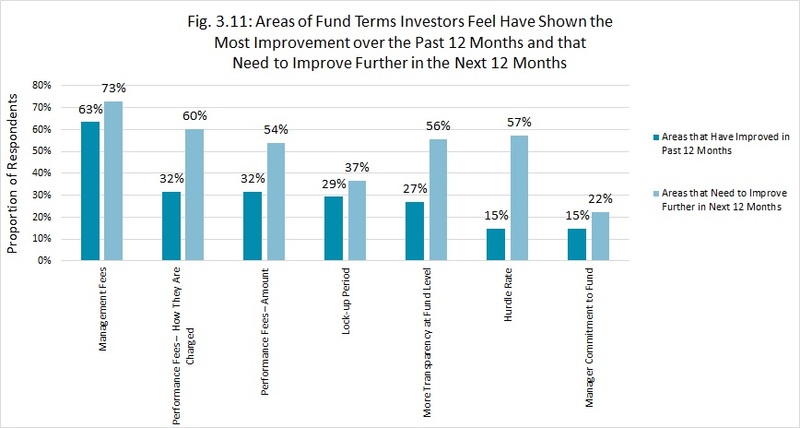 Surveyed investors were also able to recognize some improvements that the hedge fund industry has made over the past year, notably in the general category of fees charged. Significant strides were made in the level of management fees charged, and how these fees are communicated. Regarding the charging of management fees, almost two thirds of the respondents felt that movement in the right direction was made, while the majority wants to see even more of this effort in 2017. Also interesting to note in chart 3.11 is the rising level of investor interest in applying a hurdle rate to fund terms, with 57% of respondents desiring to see some form of hurdle applied to fund performance fee calculations. Hedge fund managers might want to take a close look at how they have described their fees, both management and performance. They also should ensure that their documentation and marketing efforts articulate how these fees support the business operations and infrastructure as well as the alignment of interests with limited partners. KEEPING AN EYE ON THE COMPETITION…. 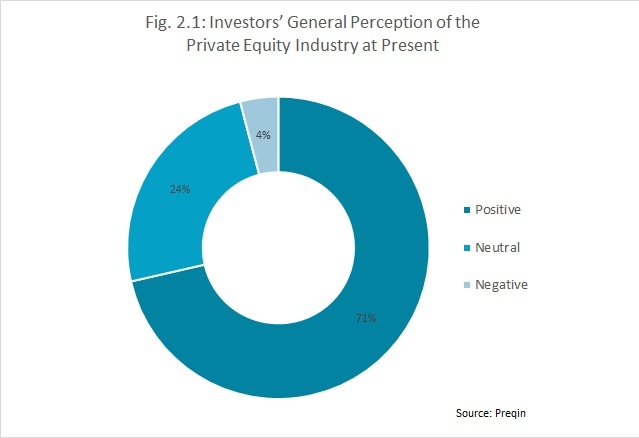 Another interesting piece of data captured by Preqin in this survey centers on the increasingly positive attitude investors feel toward private equity as an alternative investment choice. An overwhelming 94% of investors feel positive or neutral about the current state of the private equity industry, a figure that dwarfs the enthusiasm investors feel about hedge funds currently. There are many factors that play into this affirmative state of mind, most notably that private equity investors believe their investments have met or exceeded return expectations over the past 12 months, and the majority of these investors plan to increase or hold steady their allocation to private equity going forward into 2017. Why is this beneficial to investors? How does it differ in a positive way from other investments? Are my terms attractive and competitive? Does the future market environment hold promise for this type of investment? Diane Harrison is principal and owner of Panegyric Marketing, a strategic marketing communications firm founded in 2002 and specializing in a wide range of writing services within the alternative assets sector. She has over 20 years’ of expertise in hedge fund marketing, investor relations, sales collateral, and a variety of thought leadership deliverables. In 2015, Panegyric Marketing received AI’s awards for Best Financial Services Marketing & Communications Firm and Business Excellence in Strategy & Positioning Statements – USA as well as M&A’s Excellence in Financial Services Marketing – USA, and Best Financial Marketing Firm – USA. The firm also wonconsecutive year awards in 2013-14 as IHFA’s Innovative Marketing Firm of the Year and AI’s Marketing Communications Firm of the Year- USA. A published author and speaker, Ms. Harrison’s work has appeared in many industry publications, both in print and on-line.